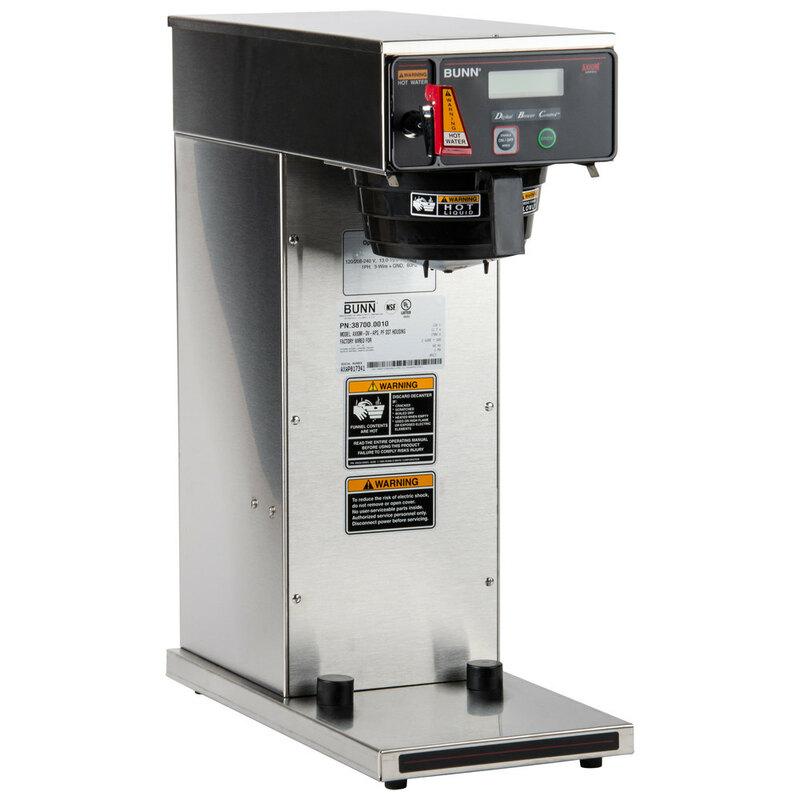 Perfect for large hotels, buffets, or catering operations, the Bunn Axiom DV-APS airpot coffee brewer can brew up to 7.5 gallons of coffee per hour! Its tall design allows you to brew directly into 1.9 to 3 liter airpots, sold separately. 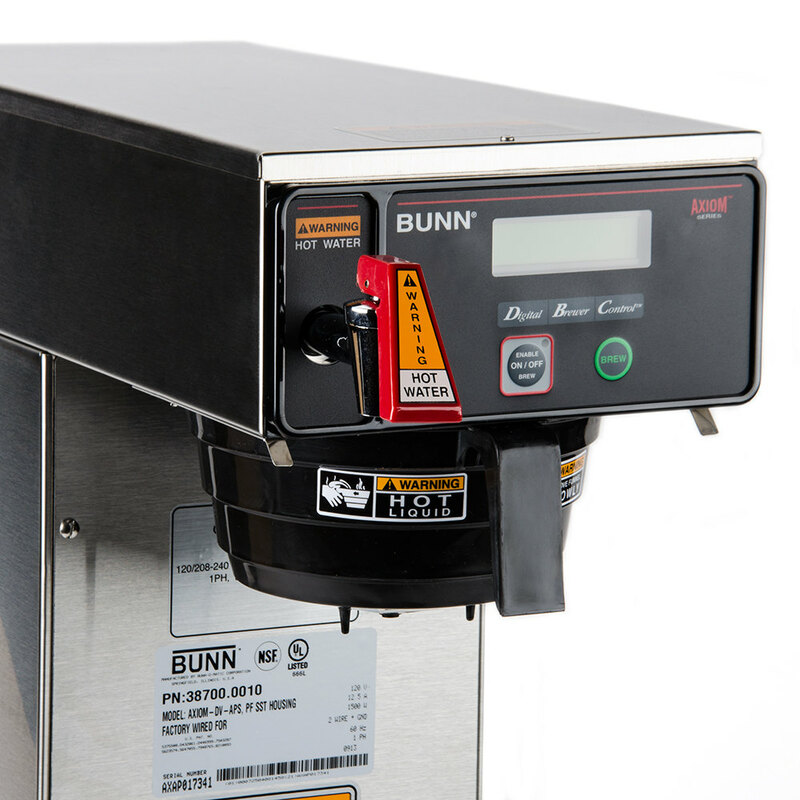 Programmable digital temperature controls coupled with Bunn’s innovative pre-infusion technology provide optimum flavor extraction and a consistent, quality product for your customers. An LCD display makes it easy to monitor temperature settings and batch information. Electronic diagnostics and a built in tank drain make cleaning and servicing simple. This unit is dual voltage adaptable and can be wired for a 120V, 120/208V, or 120/240 electrical connection. A cord and plug are only included for use with a 120V, 15 amp connection and models operating at 208 or 240V must be hard wired. 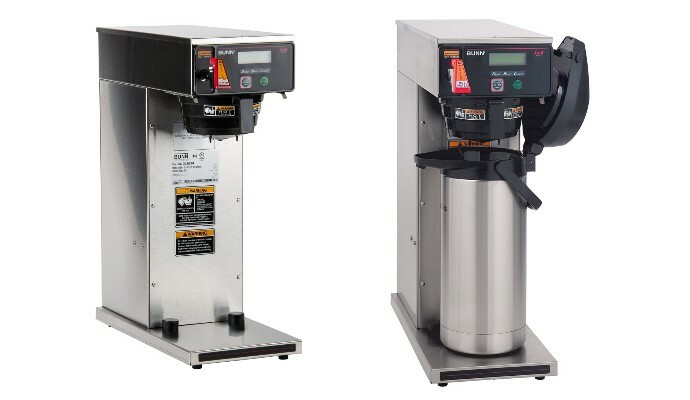 The BUNN AXIOM DV APS Dual Voltage Airpot Coffee Brewer with LCD offers a programmable digital temperature control coupled with innovative pre-infusion technology to provide optimum flavor extraction and a consistent, quality product for customers. An LCD display makes it easy to monitor temperature settings and batch information. Electronic diagnostics and a built in tank drain make cleaning and servicing simple. Flip a switch and change to 120 volt/12.5 amp, 120/208 volt/13 amp or 120/240 volt/15 amp. Airpot sold separately. We own a small bakery and were using a coffee service for the last decade. I bought this brewer to cancel the coffee service and replace the older brewer that was supplied by them. I like the ability to control not only the amount of coffee being brewed but also the temperature. It only allows a single setting though– I wish it had the ability to have two settings: one for regular and one for decaf. Another plus is the ability to shut the entire system down with a kill switch on the back. This way it isn’t burning electricity keeping the water hot when we are closed. We have 6 of these units programmed identically for about 500 people in 6 kitchens. I’ve used them for 2 years now with little issue. There are a lot of settings. Some are useful. Not all are well explained in the manual. I highly recommend the BUNN DV APS Axiom Dual Voltage Airpot Coffee Brewer. Buy a 0.25 in female flare to 0.25 in male compression brass fitting when you get this. You will thank me later. It’s the easiest way to plumb. It took us a long time to learn that this was an option. Most hardware supply stores won’t think of this and will suggest a copper tube based adaptor. This product simply works. The programmable display and config is awesome. Buy with confidence. I used a 2.2 L airpot and it works well. Initially I configured it for USA, then reset everything to metric. The front hot water spout is very handy. The price is excellent, but you are rolling the dice for a refurbished unit . This coffee brewer arrived looking brand new and was a replacement for a Brewmatic M-90 Airpot Brewer. The Bunn Axiom unit fit nicely on the coffee cart space, and the waterline and electrical hookup was a snap. I read the instructional manual and checked the voltage setting. Everything worked fine as I brewed the first pot that was factory set at 64 oz and 200 degrees. Great, but most airpots have a volume of 2.2 liters (appx 75 oz). So I tried calibrating the volume flow as per the owner’s manual. Could not access any function. So, went online and got the operating manual from the Bunn site. Read through it, flipped the factory setting lock switch, and still no avail. So, stuck with a volume setting of 64 oz. Machine works but would like to calibrate the volume flow rate. Seems like the older coffee models with manual thermostats and volume controls (simple timer adjustment) is all that is needed. These computer circuits that can adjust a hundred or so calibrations is over kill. 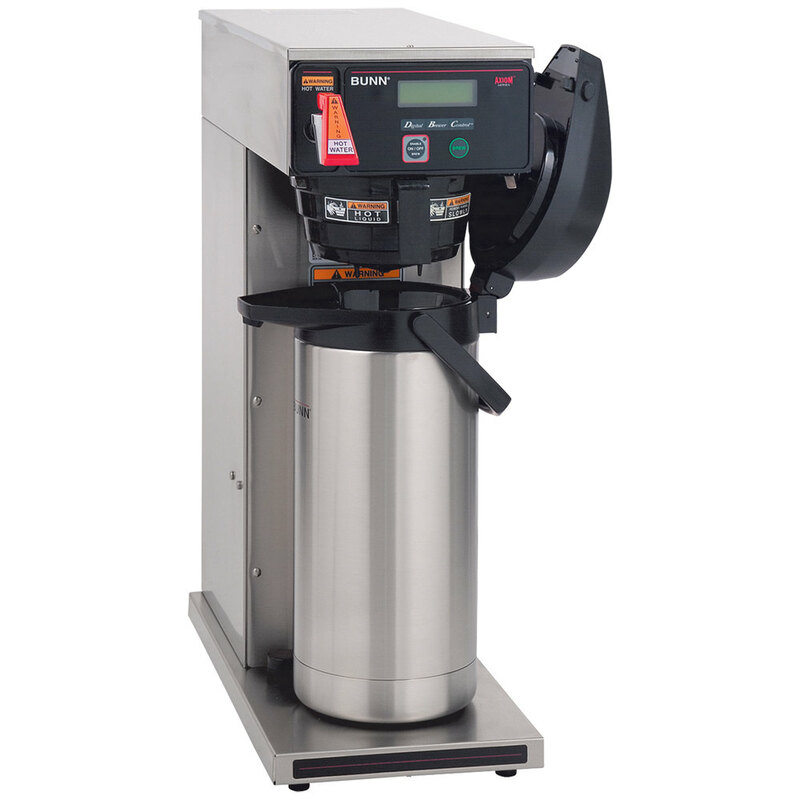 This machine brews coffee and is not meant to calculate the distance to other planets. If anyone knows how to make this adjustment, please let me know. So, I rate this item IT’S OKAY.